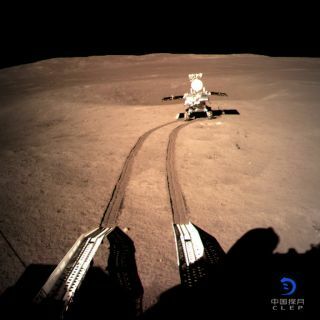 China's far-side moon rover Yutu 2 has woken up from its nap as planned, according to Chinese media reports. "China's space engineers care about the reactivation, as the last model [Yutu 1] failed its first awakening in February 2014," China's Global Television Network (CGTN) reported today (Jan. 10). Yutu 1 was the rover on China's Chang'e 3 moon mission, which landed on the near side in December 2013. Yutu 2's handlers powered the rover down a few days later, in a "noon nap" designed to protect against temporarily high lunar temperatures. Meanwhile, a suite of international payloads carried by Chang'e 4 have started operations. A neutron radiation detector aboard the lander, developed by Germany, and a neutral atom detector on the rover, developed by Sweden, have both been switched on, according to a statement by the China National Space Administration (CNSA). Both detectors have been booted up and are under testing. The Swedish device, the Advanced Small Analyzer for Neutrals (ASAN), will study how the solar wind interacts with the lunar surface. ASAN, which was built in collaboration with the Chinese National Space Science Center (NSSC), is the first energetic neutral atom sensor ever deployed on the lunar surface. From a vantage point of only a few decimeters above the regolith surface, ASAN will measure energy spectra of energetic neutral atoms originating from reflected solar wind ions under different solar wind illumination conditions. "Yes, we have successfully started commissioning of ASAN and expect the first science data before mid-February," ASAN principal investigator Martin Wieser, a researcher at the Swedish Institute of Space Physics, told Inside Outer Space. "It depends on the rover being in a favorable position." ASAN is mounted on the Yutu 2 rover, allowing the instrument to perform measurements at different locations. These data could shed light on the processes responsible for the formation of water on the moon, researchers have said. The moon's Von Kármán crater, landing site for China's Chang'e 4 mission. NASA's Lunar Reconnaissance Orbiter took this mosaic image, over which a 5-degree latitude and longitude grid was added. Chang'e 4's historic landing was tricky, said Yang Yuguang, a professor at the China Aerospace Science and Industry Corporation. Yang also highlighted the importance of a new low-frequency spectrometer carried on the Chang'e 4 mission that will conduct a radio-astronomical study from the far side, an ideal place to conduct such work as there is no radio disturbance from Earth. Chinese space officials have noted the cooperation offered by NASA, specifically orbital data from the American space agency's Lunar Reconnaissance Orbiter (LRO). The Chinese side has provided its NASA counterparts with information about Chang'e 4's landing timing and location, CNSA officials said. LRO is slated to fly over the landing area in the coming weeks and may spot the Chang'e 4 hardware on the surface. LRO will be able to scout for the Chang'e 4 lander and Yutu 2 rover at about midnight on Jan. 31, Mark Robinson told Inside Outer Space. Robinson, of Arizona State University, is principal investigator for LRO's LROC camera system. An artist's illustration of China's Queqiao relay satellite, which launched in May 2018 to relay data between controllers on Earth and China's Chang'e 4 mission on the moon's far side. An Argentina-based ground station built by China has played an important role in the monitoring and control of the mission. Furthermore, ground stations run by the European Space Agency will also offer support, according to Xinhua reports. "International cooperation is the future of lunar exploration," Wu Weiren, chief designer of China's lunar exploration program, told Xinhua. "The participating countries would share the costs, risks and achievements, and learn from each other. We hope to have more international cooperation."